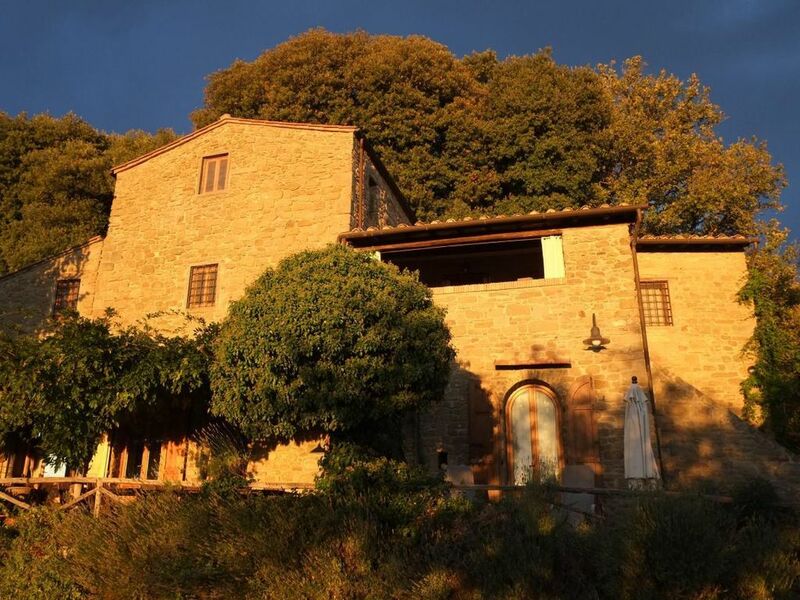 Casa Torre, authentic Tuscany country house for people who love the original. The historic Borgo Morgiano at 700 meters in the hills of Pratomagno, with its two stone houses Torre and Odina offers a stay in natural and idyllic surroundings with fantastic views of the Chianti mountains and the Arno valley. "Torre" is a "Casa Torre", a former tower house. The apartment (80 - 110 square meters) extends over two or three levels and can be extended via intermediate doors, depending on occupancy. In the old walls you will find a homely living atmosphere. In our generously equipped kitchen cooking becomes a pleasure in the evening. You can relax by the log fire or enjoy a glass of house wine on the loggia overlooking the valley and the sunset over the mountains. Solid wood beds, wooden slatted frame, mattresses natural latex / Schafschur; Bed linen, bath, shower and towels available. Kitchen equipment: fridge with freezer, four-burner gas stove with electric oven, dishwasher, (German) Coffee machine, (Italian) macchina per caffè, red wine, white wine, champagne, water glasses, stainless steel pots and pans, tea towels, table linen. Central heating, closed fireplace in the living room. Loggia with table / seating; Terrace space at the foot of the stone staircase. Moorings in the outdoor area. Radio / CD player. WLAN in the house library. The house library in the annex can be shared. Pet: once per object cost of 30 EUR (compulsory). Extra bed: to rent once per person for 30 EUR (optional). Intermediate cleaning: per object and day according to consumption (obligatory). About 40 km south of Florence lies Borgo Morgiano in the midst of a terraced nature park at an altitude of 700 meters on the slopes of Pratomagno, which rises to 1,600 meters at its highest point. Here the climate is pleasant and relaxing even on hot summer days. Morgiano one of Castelfranco di Sopra, which has retained its medieval center. The origins of Borgo Morgiano date back to the 14th Century. Morgiano is estimated as a place of peace and closeness to nature. A place to relax and be with yourself. You are welcome to bring your dog, as long as it is suitable for the home. The Borgo consists of only two old stone houses. In the second house there are two holiday apartments and the house library. Pet (once per object, costs in the amount of 30 EUR). Internet (per object and day, included in the price 0 EUR). Firewood (per object and day, included in the price 0 EUR). Cot (once per object, cost of 20 EUR). Parking (per object and day, included in the price 0 EUR). Extra bed (per object and day, included in the price 10 EUR). Intermediate cleaning (per object and day, included in the price 0 EUR).